Look through the front window of our studio and you’ll see the Oldsmodesk peering back out at you. 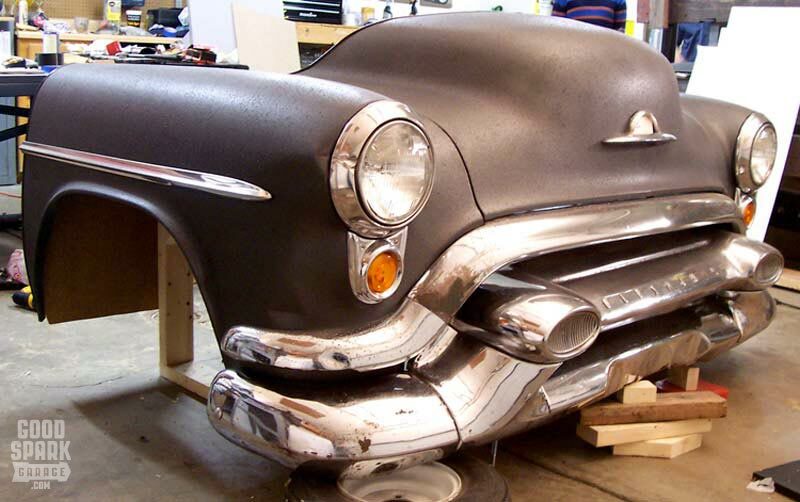 A 1953 Oldsmobile 88, found deep in the woods of central Indiana, came back to life as a workstation for our Indy-area graphic design office, Wilkinson Brothers, Inc. Here’s a look at how we repurposed some Detroit steel and retained its character and patina. 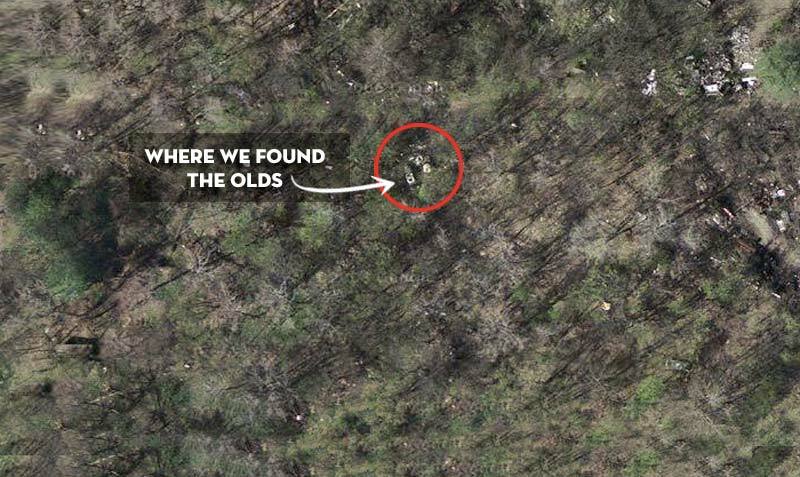 While roaming the woods just outside a metal scrap yard, we found a sprinkling of old cars (see satellite view below). Some as far back as the 40s and most with major damage. 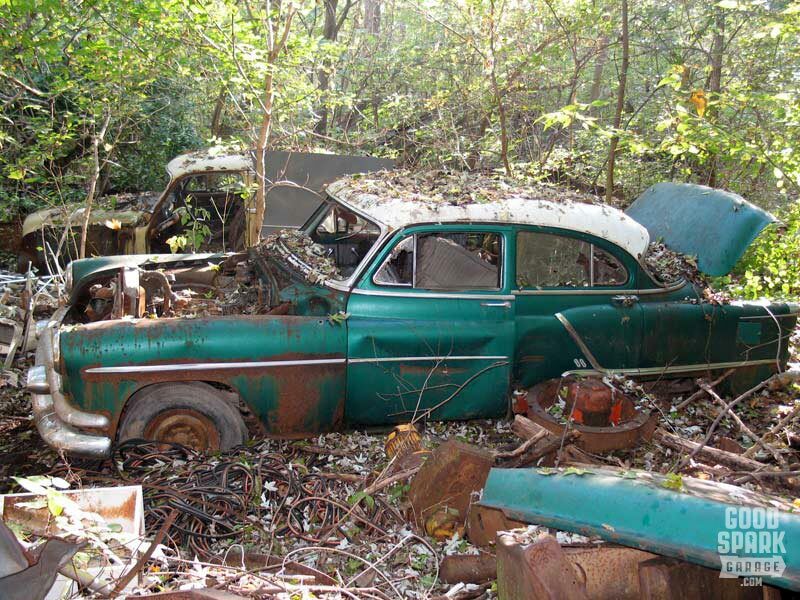 The front of the big green Olds was in decent shape, a great candidate for a car desk. We extracted only what we needed from the yard with a generator, cutting wheel and torch. 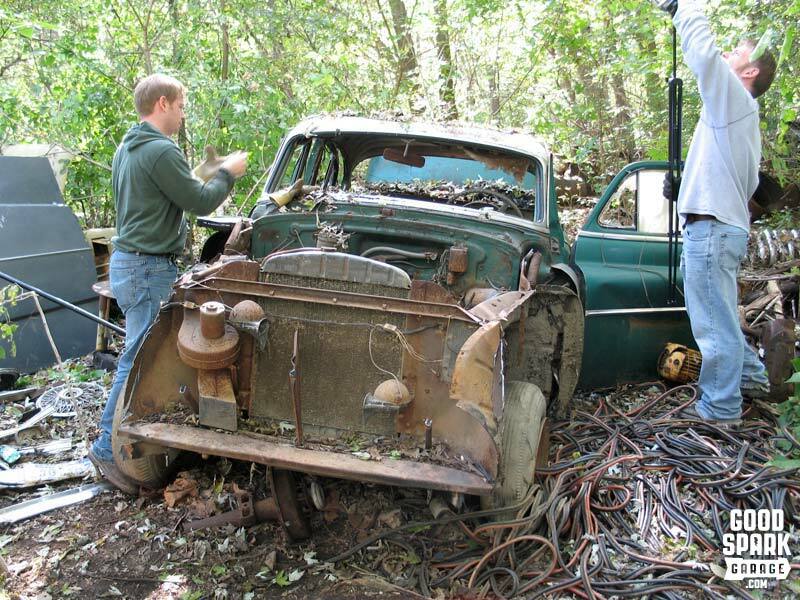 The thick steel and chrome were pitted; the car had a ton of character. 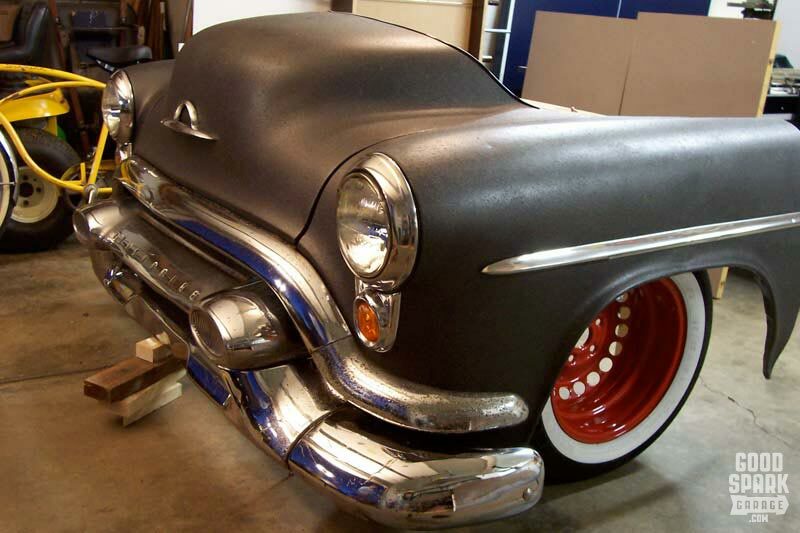 Earlier years of this model inspired the R&B song “Rocket 88” which has been credited by Sam Phillips of Sun Records as the first rock and roll song. 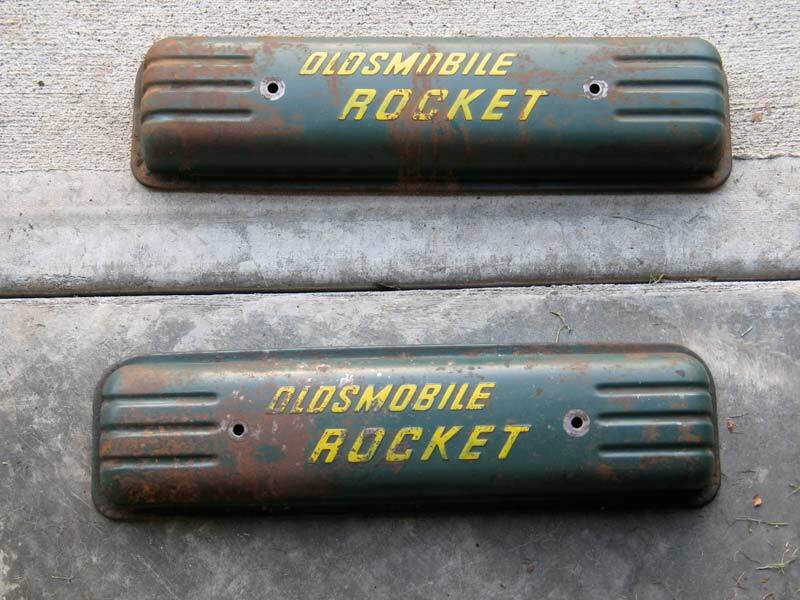 “You know it’s great, don’t be late; Everybody likes my Rocket ’88.” It featured the powerful Rocket V8 in a relatively light body, making it a precursor to muscle cars. The 1949 version of the Olds 88 became the King of NASCAR, winning several races until being challenged by the Hudson Hornet. The model didn’t change much from ’49-’53. 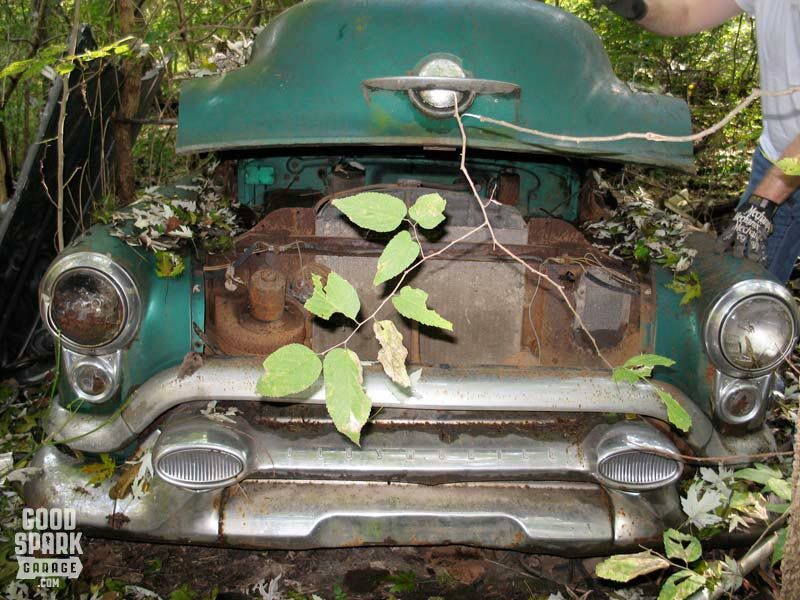 New options for the 1953 included Frigidaire A/C and power steering. 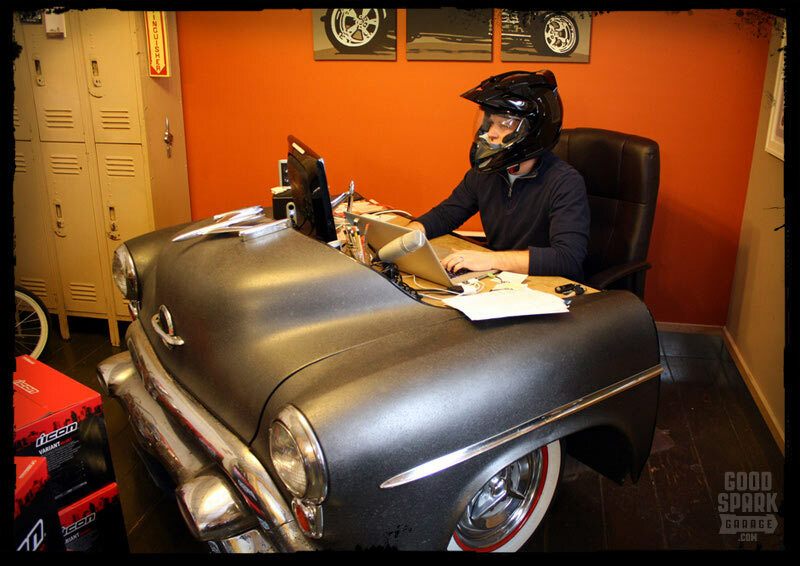 We trailered the fenders, hood and bumper to Casey’s garage and began mocking up the desk. 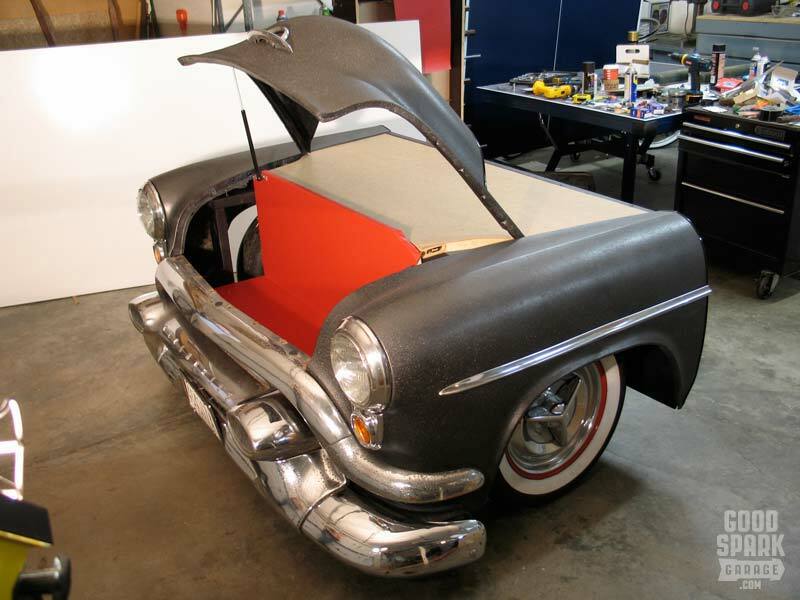 A wooden chassis would act as the skeleton to hold it at the right height (we dug the low slung look). As simple as it is, the 2×4 construction is solid, allowing a person to sit on the fenders with confidence. 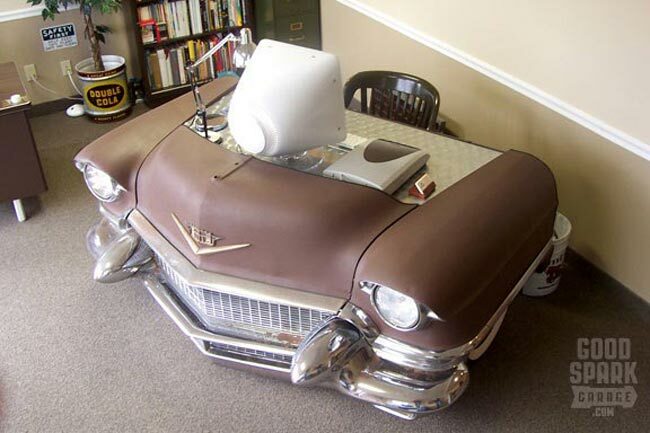 Years before, we built a car desk made from a Cadillac Sedan de Ville (see the “Desk de Ville” below). For that project, folks would ask us, “do the lights work?” No, they didn’t. 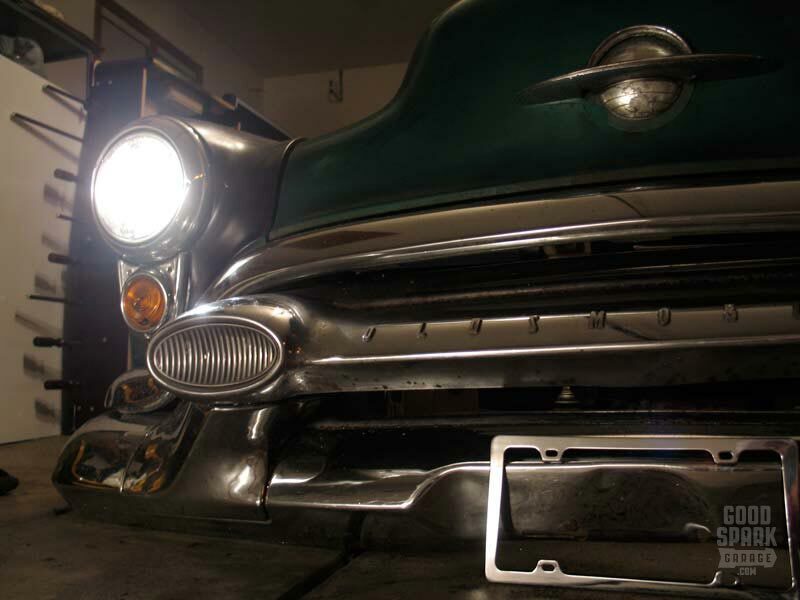 But this Olds would employ new headlights we picked up at AutoZone, as well as a working horn. For paint, we applied a coat of FleckStone spray paint (now called Stone Touch) all over the cleaned, rusty metal. This gave it a consistent, textured surface. Then we followed that coat with a finer coat of Textured Metallic paint for an all-over graphite/silver tone. With steel wool, a little chrome polish and elbow grease, we found plenty of shine left in the trim and bumper. The original wheels and tires were toast, so we used an old set of VW Passat wheels and tires we had laying around. 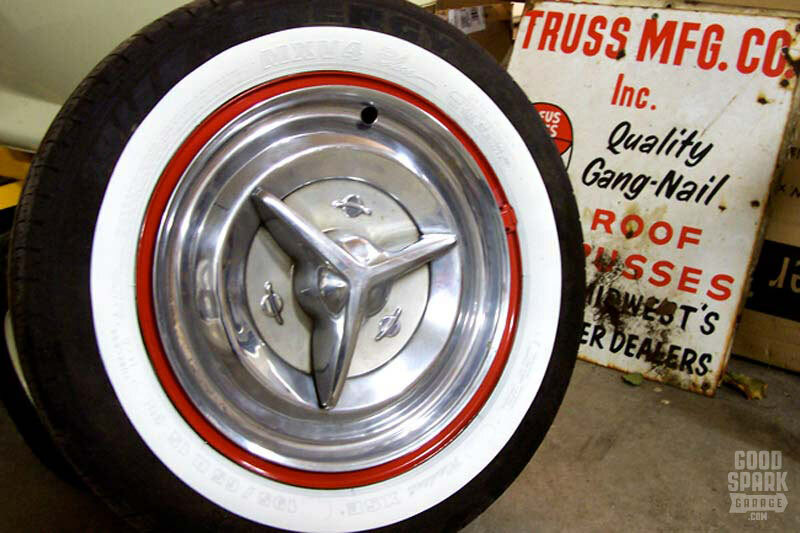 The wide whitewalls were taped off and painted right on the tire; the rims got a coat of gloss red. 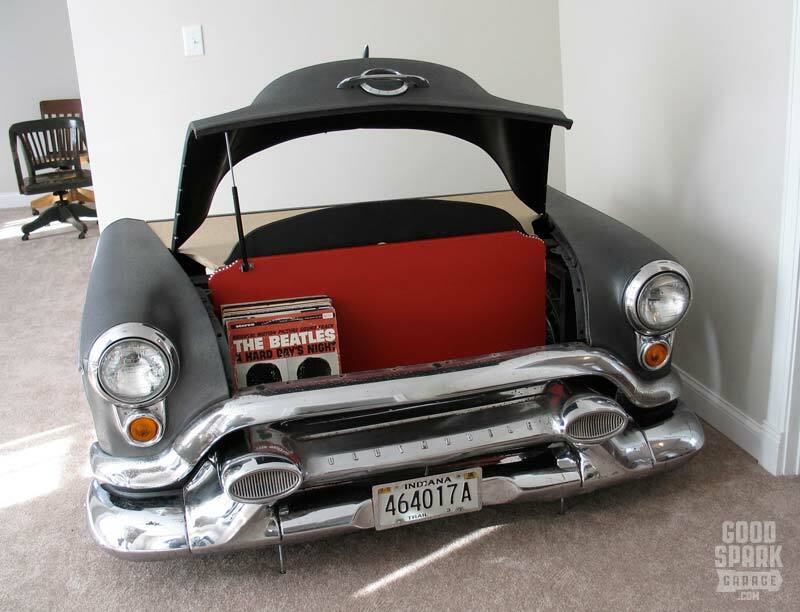 When a client and local politician heard about us building a desk out of a ’53 Olds, he told us he had two hubcaps from a ’54 Oldsmobile hanging in the garage if we wanted them. Yes! They were a perfect fit; snapped right into the VW wheels. For this desk, we’d hinge the hood to create access to storage space. A gas shock from NAPA, used for an SUV’s back hatch, holds up the nose. Since the rocket hood ornament had been broken off before we found the car, we turned to eBay to find a replacement. We removed the aged plastic globe that fits in the nose emblem, making it an ideal handle for opening the hood. Folks tend to think it’s a heavy, hard-to-move chunk of steel. Really, it can be divided up into 4 or 5 major pieces (not counting the wheels) which all easily fit through standard doorways. In terms of vehicles, this thing is a driver; nowhere near a show piece. Like our motorcycles, it’s meant to be used. With nicks, rust and over half a century of wear, it gets the job done. 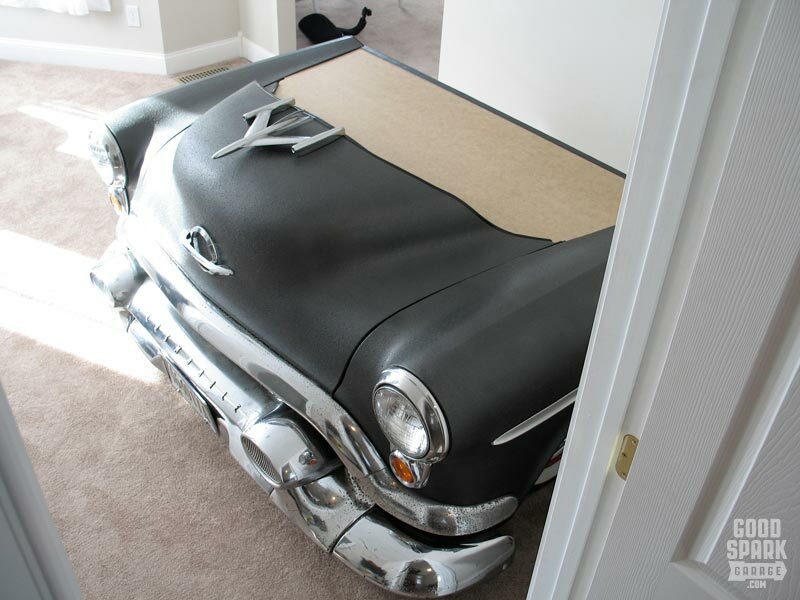 Of course, it still turns heads as passersby discover the old American car is actually furniture. 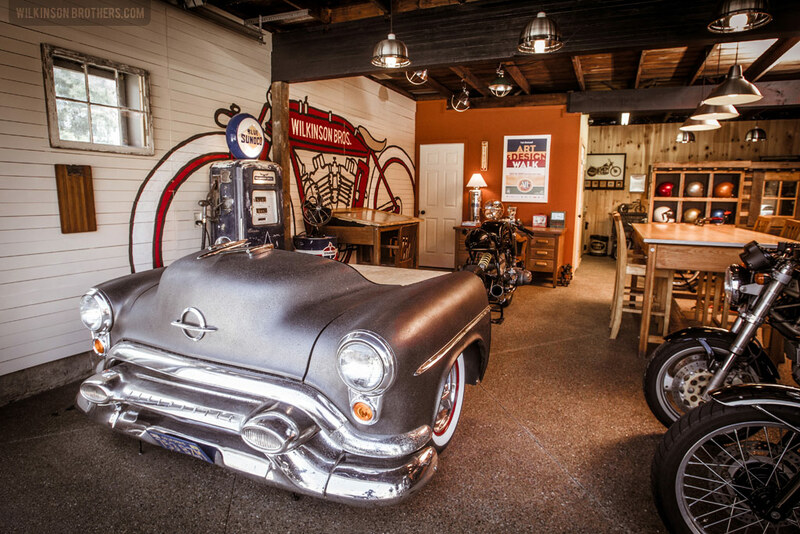 Here it is below in its current environment, the garage studio of Wilkinson Bros (the creative entity behind Good Spark Garage). 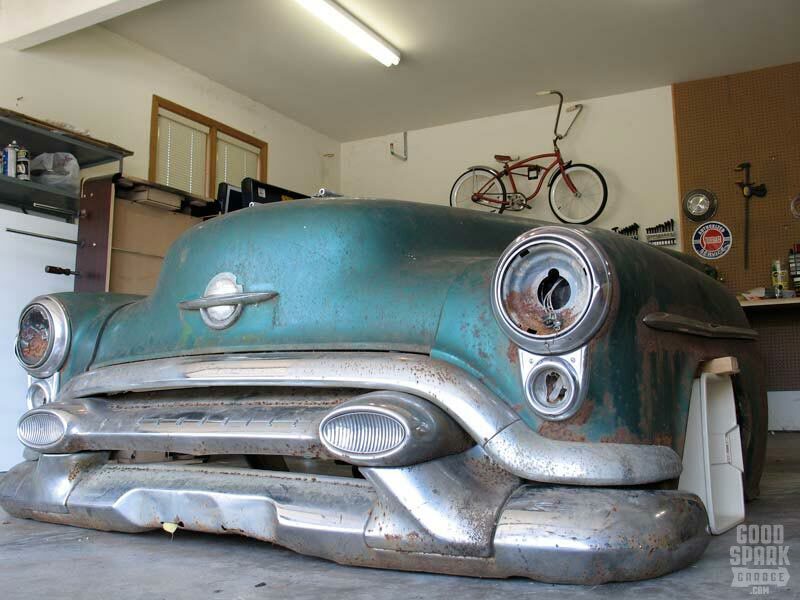 Keep it tuned in here or follow us on Twitter to see our next piece of functional decor made from the front clip of a 1957 Buick Special.